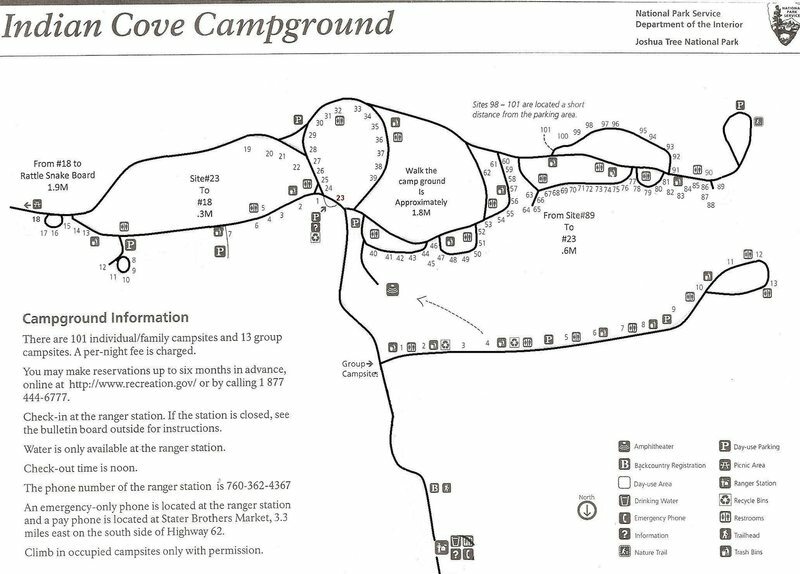 Campground Map as provided by the park (some editing for clarity) in Indian Cove can be reserved and cost (as of Jan 2019 $20/night) -- on the other hand, there's no park entrance fee. The rock tends to be slightly grainier than some of the other popular areas (Lost Horse, Real Hidden Valley), and many of the routes are a bit shorter. Nonetheless, there's some great climbing here, probably close to a thousand routes from 5.0 all the way up, and as a bonus most of it is within a hundred yards or so of the road, so the approaches are practically non-existent. A few less populated crags lie up on the slope of the Wonderland of Rocks (the south side of IC) or up Rattlesnake Canyon in the Wonderland. Certain formations at Indian Cove can be overrun with gang-ropers (Feudal Wall, Short Wall, Billboard Buttress, Pixie Rock), so plan accordingly. Other great areas to check out include Moosedog Tower, Dos Equis Wall, Corral Wall, Wonder Bluffs, and more that I don't have time to list here. One general word of warning: the further north you get, the grainier and more crumbly the rocks tend to get. Grain Central Station has that name for a reason, and although Morbid Mound is relatively popular, I can't figure out why. Follow the 29 Palms Highway past the entrance to the main park in the town of Joshua Tree. The entrance to Indian Cove is between the towns of Joshua Tree and Twentynine Palms. Keep a look out for Indian Cove Road, on the right side of the highway. If you're approaching from the west, look for a Del Taco billboard to mark the spot. Turn south on Indian Cove Road and head straight into the park. After a couple of miles, you'll pass a small ranger station, and after another mile or so, you're there. Desert Iguana. Photo by Blitzo. Rainbow in Indian Cove right after the rain. Desert Tortoise. Photo by Blitzo. A nice fat chuckwalla pumping in the sun. Clouds and Rays at Indian Cove. Photo by Blitzo. Aid Superstars at Indian Cove. Photo: Yoav Altman. Indian Cove-snow. Photo by Blitzo. Lightning near Indian Cove. Photo by Blitzo. Watch where you put your hands. Photo by Blitzo. Clouds over Indian Cove. Photo by Blitzo. Thunderhead-Indian Cove. Photo by Blitzo. The new market at Indian Cove. Photo by Blitzo. Indian Cove-Spring Storm. Photo by Blitzo. Some new route in Indian Cove. Photo by Blitzo. Hedgehog cactus in bloom. Photo by Blitzo. Mojave Yucca-Indian Cove. Photo by Blitzo. Del Taco sign, and general store. Soloing with Blitzo, Indian Cove. Rock and yucca. Photo by Blitzo.